Edwina Wyatt has been down the path to success with three picture books under her belt, and already had TWO of these awarded Notable Books in the Children’s Book Council of Australia awards. But more on that later. 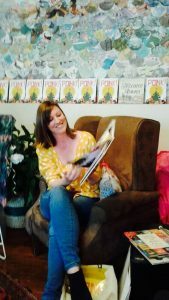 Today we have the pleasure of getting to know more about how she took the road from law to children’s writing, how she practises her craft, the most valuable thing she learned from the publishing process, and a bit on how her Dad was involved in the making of one of our personal favourites, Ponk! Anyone know what ‘ponk’ is in French?! Thank you so much for agreeing to an interview, Edwina! Shall we begin with your journey into writing for children? Where did this interest come from? How did this lead you to become an author? Hi Romi, thanks for having me. It never occurred to me to be a writer. Although when I look back at the various careers I have invested in, I can see that they all have the common thread of people and story. I wasn’t collecting picture books at that stage…I have a real problem now. I put it on the kitchen table. It was so bright and beautiful and I drew immense comfort from reading a children’s book again, so steeped in nostalgia as they are. I was surrounded by a wall of hefty law tomes, feeling overwhelmed, and my eye kept being drawn to this plucky emu. It is fitting that the story is all about finding your place in the world, and like my feathered friend, I had started many different career paths and was feeling a little lost. I kept reading and analysing the story instead of doing my assignments, appreciating how taut and structured it was. How deceptively simple. In an act of massive procrastination, I typed out the whole story, word for word, to see what it looked like without the pictures. That was the moment I would pinpoint the beginning of my obsession with picture books and I spent most of that year blowing my meagre earnings on picture books, digging out my old ones and writing horrible, awful, eye-clawing attempts: which I still do daily. How did you go about learning and improving the craft of writing? Your stories are always full of emotion, thought-provoking messages and beautiful, poetic-like language. How do you develop your ideas? Does your style come naturally or is it a part of your practice? You are very generous, thank you. Writing is most definitely a craft and I am happy to be a life-long student. Of course, you have to read and you have to write (freely, badly) to improve. I think part of writing is giving yourself over to learning. To understanding that it will never be perfect, that your voice and style will change. That it is all subjective and that you will probably always be disappointed with the end product. But I think that is a small price to pay for the privilege of being able to give it a go and to engage with the vibrant kids’ lit community. And I am so very grateful to the editors, publishers, agents and readers who have given me a chance and an opportunity to improve. I think most of my ideas develop from an interest in meaning. Finding ways to play with it. Dissect it. Tease it out. Explore it. Distort it. Probably not the best career choice for a chronic over-thinker…it only encourages more over-thinking! Voice and style is such an interesting, mysterious concept in general and I think I will always be pondering what it is, how it manifests and what it all…means. Oh no…and she’s off. Your first published picture book is ‘In the Evening’, illustrated by Gaye Chapman and published by Little Hare Books. How did you go about submitting this one and what was the process as a first-time author like for you? Does it get easier with subsequent books? This story was submitted via an agent who took me on after reading a positive rejection letter/ invitation to resubmit from a major publisher. They had pulled the story (a different text) from the slush pile but never ended up taking it on. The lovely feedback helped me though, and was a huge leg up. Just goes to show that rejection can be good for you! The process of getting each story acquired and brought through to publication has been very different: some quick and joyful, some slow and full of hurdles. No book has the same passage. As a first-time author, I just felt like I had got to base camp. Still do. Probably always will. That said, there is no ascent I am trying to climb as the best days are just the ones where the words are flowing and you are enjoying it. It is not glamourous or lucrative or anything else that people might associate with writing. Most books have taken between 2-6 years to come out once first being contracted. That is a long time and your life and tastes and writing changes in that period. And I have heard it said that picture books have a shelf life of a tub of yoghurt once they finally hit stores. This has certainly been my experience. The best thing to come from it all is the relationships I have made through this pursuit. They are what keep me going. Any loss or small victory is short lived and superficial. 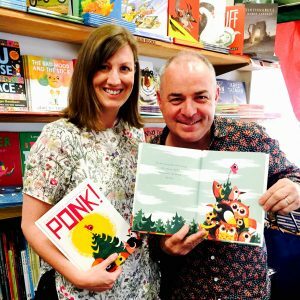 Your most recently released book is ‘Ponk!’, a gorgeous and comical story about a little bird determined to see the big world. Does this theme reflect your own personal belief, or motto, if you will, about never giving up, no matter how many times you fall? (Sounds a lot like the publishing journey!) What inspired you to write this? This character comes directly from my childhood. We had a big Norfolk Island pine next door and my dad used to tell us about a little bird who lived up there and would fall to the ground: ponk! As kids we delighted in the slap-stick humour and would roll around. He would whistle when the bird fell. The tree got chopped down. It was devastating when it happened and the whole street seemed different. I was sitting at my desk one day, thinking about that tree, and I thought that there was more to this bird. I wondered what his story was. Why did he keep going up? Why did he keep falling down? Could he see something up there? Were there others living in the tree? What did they think of him? What did he really want? For fun I wrote a narrative as a surprise for my father. To the true creator my father, Jim. You put the ‘P’ in Ponk! I wrote about fifty different versions with different themes and storylines, but in the end the device of Plunk, Thunk and Donk bird stopped me from ripping it to shreds. I am glad I didn’t give up as that would have been some poetic irony. I didn’t reveal it to my family until it was finished. And when we did, my son helped me read it to Dad and he did the whistling sound effects. All very Lion King – Elton John- Circle of Life! So, it is special for me that my kids and my sister’s kids get to have Ponk now, too. And he is flying far, next stop France and China. We are all wondering what Ponk is in French? Last time in our interview with Edwina Wyatt we learned how her own obsession with picture books led to publication, despite her attention meant for other things. 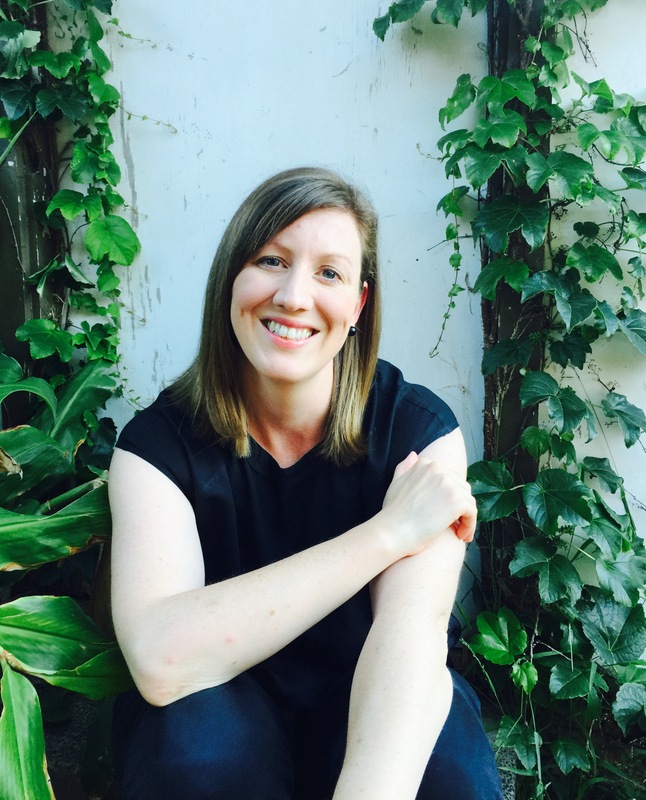 In today’s installment, we find out why this chosen career path is so important to her and the ways she has immersed herself in her role as an author. I love how she remains so humble in light of her magnificent success! Edwina, we’ve already established you love writing for children, but is there something in particular that warms your heart? When a kid yells out ‘boring’ at the crucial part of your story when you are doing a reading and it only makes you laugh. And it’s still worth turning up to work the next day. Do you write in genres other than picture books? How would you compare writing these to other forms of writing? I do indeed, but only recently. My publisher at Walker Books, the incredible Nancy Conescu, suggested to me last year that I might try my hand at writing something for older readers. I am forever grateful that she has seen potential for my voice to stretch in new interesting ways and is willing to mentor me in this capacity. As a result, I am working on some bits and pieces that I hope to share soon. Two of your books, ‘In the Evening’ and ‘Together Always’ were awarded Notable Books in the Children’s Book Council of Australia Awards (2016 and 2017, respectively). Congratulations! How did these come about and what was your reaction to the news, on both accounts? What does this mean for you and your writing career? I was very humbled on both occasions to be included alongside so many hardworking and talented creators. I think focusing too much on awards is not healthy or helpful, though. Many of the best books that I cherished through the year and predict as winners often miss out and I could list dozens of books I think deserve more recognition than they have received. If it was an objective measure of quality, then all the same books would win all the awards, but they don’t of course. And how to measure the success of a book? The pressure on authors is immense: too literary, too commercial, too complex, too simple. You can win an award but not be commercial. You can miss out on an award but sell lots of books or make foreign sales. You can miss out on sales and awards but be loved by one reader. You can write a book that parents and teachers love but kids don’t or vice versa. You can do well with one and have your others compared to that. Or any other combination. There are just so many ways to measure success and all of them are equally fraught. So best not to concern yourself with it at all. As an author, my goal is just to keep working; to keep creating in times of self-doubt and white noise. And I want to support all those other creatives at any stage of their careers, and thank them for giving their voice so generously to us. And if incidentally, I make one little human feel a little less afraid, care a little more, or make them laugh or feel something or even say, I don’t get it? Then that is fantastic. Even if it has nothing to do with my story, but is merely a product of the time that someone is spending with them to read it. It’s enough just to have been part of something ephemeral and fleeting and for my kids to know that I spent my time doing something I am passionate about. A very positive and wise attitude! What kinds of events or presentations have you been involved in as a guest speaker? What value do you see for authors in presenting to children? I am represented by the Children’s Bookshop Beecroft Speakers’ Agency. 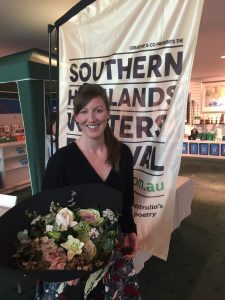 I have done some school visits and have been a guest speaker at various festivals and literary events including Sydney Writers’ Festival, Goulburn Writers’ Festival and the Southern Highlands Writers’ Festival. I have done the last couple of years at the Illawarra CBCA Kids’ Day Out and Literary Lunches: great fun. There is enormous value to be found in doing these presentations, although it’s hard to quantify. Perhaps for authors, it is just the unexpected moments that come from saying yes to challenging (potentially terrifying) things. I am excited about my forthcoming picture book FOX AND BIRD out next June 2019 with Little Hare, illustrated by Alice Lindstrom. Also another with Little Hare later on called OLIVE. I am also eagerly awaiting SOMETIMES CAKE in 2020 with Walker Books, illustrated by Tamsin Ainslie. There are some other projects on the boil, too, including some exciting collaborations, which I am looking forward to sharing as the details are confirmed. My pleasure, Romi. Thank you.